We all know to lock our doors, shut our windows, and look through the peephole before opening the front door, but what else can we do to make our homes safer? We talked to security experts to get their advice on making our living spaces more secure, so we can keep our possessions (and ourselves) safer from the threat of burglary. 1. EXAMINE YOUR FRONT DOOR FOR POTENTIAL WEAKNESSES. As your home’s main entrance and exit, your front door is really important. You should have a solid hardwood or steel front door, not a lightweight hollow core door. To prevent intruders from kicking your door open, you can buy a heavy-duty four-screw deadbolt strike plate (the piece of metal where the deadbolt latch goes into the door's frame) at a hardware store. The screws should be three inches long to make sure the plate is strongly attached to the door frame. For around $100, you can get a doorway reinforcement kit such as the Door Devil, which fortifies your front door’s weak spots. 2. USE TIMERS AND TVS TO FOOL BURGLARS INTO THINKING YOUR HOME IS OCCUPIED. 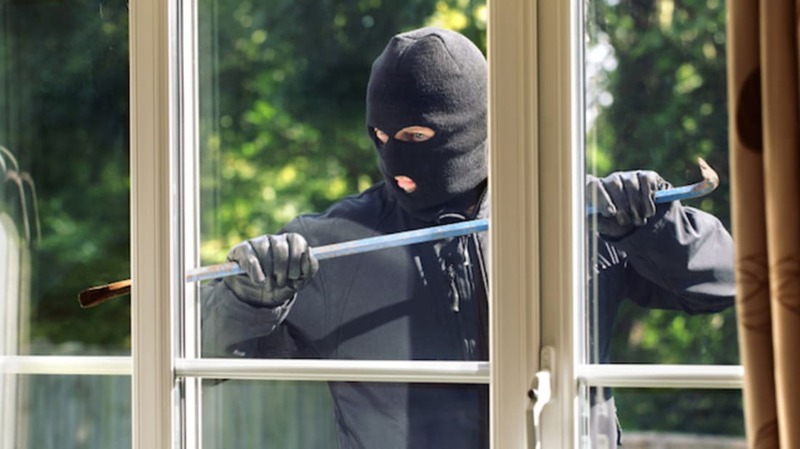 Chris McGoey, a Certified Safety Professional and Certified Protection Professional, writes on his website that “the majority of apartment burglaries occur during the daytime when most people are away at work or school.” Burglars also target homes that are dark in the evenings. By setting timers to turn on a TV, radio, and lights, you can fool intruders into thinking your home is occupied when it’s really not. For under $50, you can get a fake TV that simulates the colors and lights of a flickering TV in order to help deter burglars. 3. BE MINDFUL OF WINDOWS AND SLIDING GLASS DOORS. Because intruders can easily lift some older horizontal sliding windows and sliding glass doors off of their tracks, sliding windows and doors need extra protection. If you put a dowel or shower curtain rod in the track, intruders won’t be able to slide the window or door open even if they get past the lock. Also, if you install a window sensor alarm, you can get text or email notifications when a window in your home has been opened; you can respond by turning on the lights remotely or accessing a video feed of the location. Because burglars are looking for the easiest target, they don’t want to risk being mauled by a Doberman. Even if you don’t have a dog, consider putting a “beware of dog” sign in your yard or on your fence. You can even go the extra mile by putting a dog bowl by your side door or installing fake security cameras near your back doors to scare off potential burglars. If you’re paying a security company for an alarm, announce it with a sign and decals to deter burglars. Some people who don’t want to pay the monthly fee for an alarm service buy a home security sign to put in their yards anyway. Nick Santarsiero, a home security expert and the owner of Property Protection Consulting, warns against displaying a sign if you don’t really have an alarm system. “The perpetrators may think that every house with that sign in front also does not have protection, thus placing others in danger,” Santarsiero says. The outside of your home should be well lit to discourage burglars from targeting your home. Put motion-sensing lights by your entrances and doorways, turn some lights on and off remotely via your phone, or set your exterior lights on a timer. For the inside of your home, you should put light timers near your windows—but close your curtains so intruders can’t see them. “Light-timers are inexpensive and can be found almost everywhere. They should be used on a daily basis, not just when you’re away,” writes McGoey. 6. BE VIGILANT ABOUT VACATIONS. Vacation is a time to relax, take a break from everyday stresses, and not worry whether your home is safe while you’re away. Intruders look for small signs that someone is away on vacation, such as flyers and ads piled up by your front gate or porch. “Don't let your mail build up while you’re away, and get to know your neighbors,” says Santarsiero. If you’ll be gone for more than a few days, put a temporary stop on newspaper delivery and arrange for a friend or neighbor to collect your mail and deal with your garbage cans on trash day. And as much as you can, resist the urge to announce and post your vacation photos on Facebook and Instagram. Since most people’s addresses are easy to find online, you don’t want to tempt a potential burglar with the promise of an empty home. You can always wait until after the vacation is over to post your photos. 7. GET CREATIVE ABOUT HIDING YOUR VALUABLES. If a burglar does manage to get inside your home, though, he’s going to quickly grab the most valuable stuff he can find and get out. Convicted burglars have confessed that they “always check dresser drawers, the bedside table, and the medicine cabinet.” Instead of keeping your valuables in the usual hiding places, consider getting creative. In an online forum, DIY expert Joel Spolsky suggests leaving an old, worthless laptop by your front entrance so a burglar will spot it, grab it, and get out. 8. PUT YOUR PHONE DOWN AND LOOK AROUND. Awareness and mindfulness of your surroundings is key for keeping yourself and your home safe. Pachulski says, “The biggest threat to anyone is complacency. To be safe, or at least safer than the next person, you need to be constantly aware of changes in your neighborhood.” Be attentive to new people walking or driving through the area. If you notice that someone is loitering by your building’s entrance or seems to be following you, take notice. If you’re aware of your surroundings, you can more easily spot something that’s awry, like a broken window or a suspicious car. 9. BEFORE RENTING, ASK YOUR LANDLORD TO MAKE MINOR SECURITY IMPROVEMENTS. Before you move in, take a close look at your new apartment’s entrances, lighting, locks, and fire escapes. Santarsiero says that renters should make sure window locks work and get their existing locks re-keyed. When you think of all the former tenants and handymen who might still have a key to your apartment, you might start to worry that any random person could walk right into your apartment. Ask your landlord to put a new deadbolt lock on your front door as well as a chain lock, if your front door doesn’t already have one. And storing your valuable items in a safe won’t help you if a burglar can simply carry it away, so ask your landlord if you can bolt a safe to the floor in a closet.